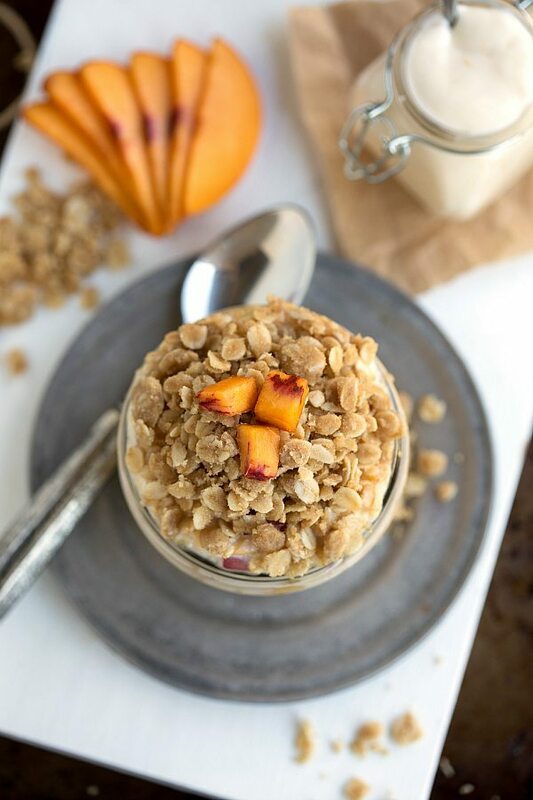 A healthy and simple on-the-go breakfast idea – peach streusel overnight oats. So this past weekend, I HELD a Koala (<– click to see a picture). It was one of the coolest things I’ve ever done! We’ve gotten to see koalas several times super up-close and pet them, but to hold one. Oh my gosh – just surreal. They have incredibly soft fur and are super cuddly. The koalas pressed their faces up to our several times while holding them which was so sweet. The ones we held have been hand-raised and love to be held. When we first walked in, one of the koalas was walking towards the door of the enclosure. The worker told us that she (the koala) was coming to be cuddled and walked to the door to be held very often. Awww. The babe was too young to hold the koalas, but both the husband and I took a turn. We got to feed the koalas eucalyptus leaves and they can chow those down and quickly!! The leaves are their main diet and it takes them a super long time to digest them. Since the leaves yield so little energy, the koalas are incredibly calm and they sleep for most of the day – about 20 hours a day. Funny enough the little guy didn’t care when I was holding the koala, but when the husband did he got super upset. He did not like his dad holding and cuddling up to anyone else but him. As soon as I took over holding the koala, the little guy was in the husband’s arms and didn’t leave them until we left! It was definitely a highlight of the weekend! Another highlight? THESE overnight oats! They are like a peach pie, but in breakfast form. So, basically super yum. 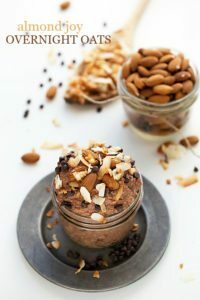 These take a teeny bit more work than most of my overnight oats, but it is well worth it and about a total of about 8 extra minutes in the morning. The peach gets sauteed until tender and then the streusel topping gets cooked in the skillet just til nice and crisp. The base are simple overnight oat ingredients. 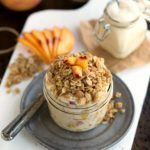 The peach yogurt adds a lot of heightened peach flavor and I of course recommend using the peach flavor, but a plain or vanilla yogurt will work great as well. All mixed together it’s absolutely delicious! Like dessert but healthy enough for breakfast! 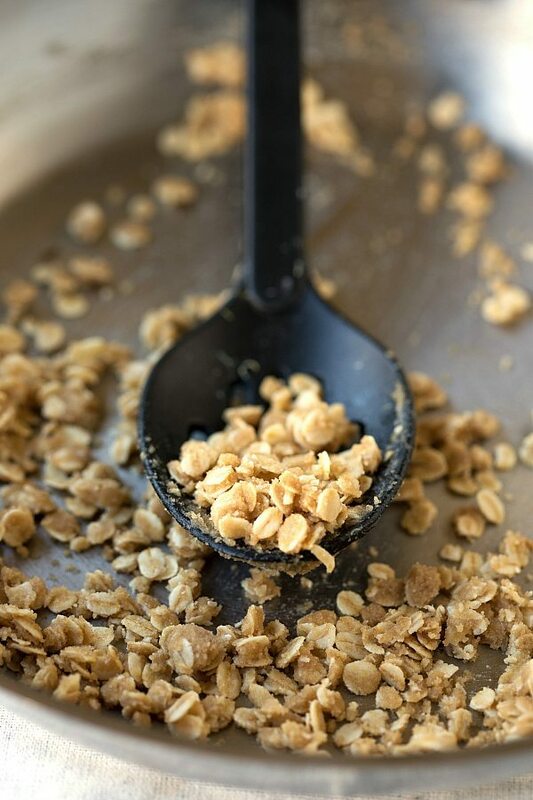 In a small bowl, stir together the oats, milk, yogurt, sweetener (I like truvia, but if you don't have it use another sweetener and make sure to scale it to taste), 1/2 teaspoon vanilla extract, and cinnamon. Stir together and place in an airtight container. Put in the fridge overnight. In the morning, remove the pit from the peach and finely chop into small pieces. Combine the chopped peach with the 1/2 tablespoon coconut oil and the remaining 1 teaspoon vanilla extract in a skillet over medium low heat. Stir until the peach is tender and fragrant. Remove and allow to cool. For the streusel: Melt the coconut oil in the same skillet used for the peach. Add the remaining streusel ingredients and stir well. Stir over medium low heat until the oats are lightly crisp and fragrant. That is so neat that you got to hold a koala! I’m sure that’s an experience that you’ll never forget. These overnight oats look like the best that I’ve ever seen, Chelsea! I’m really wishing I had this for breakfast right about now. I love the peach flavor and that it’s healthy! Pinned! So jealous that you got to cuddle that little koala! So fun! And I’m also jealous you got to eat these oats! Yum! I don’t know if I’m more excited about the koala or these oats. Maybe both? But YES to peach–I feel like it’s such a neglected flavor, but it’s so good! So so SO jealous by the fact that you got to hold a koala (that photo on your Instagram is seriously darling)! Anddd I think I might be equally jealous in how freakin’ delish these look! I’m not usually a huge overnight oats fan since the consistency turns me off, but I think I’ll have to give them a second chance! Whoa, this is some seriously mouthwatering oatmeal! I remember how my brother and I used to fight over the precious few peaches and cream packets in the variety box as kids – and this looks even better! Peaches? Streusel? What’s not to love!? I loved your koala picture. That is so cool! The set up in this photo is equally awesome. I love the white board with the silver plate. Can I ask where you found your silver plate? I currently on the hunt for one and no luck yet. For my birthday a few weeks ago the hubby took me to quite a few kitchen stores and I didn’t see a single silver plate. Seeing this just makes me crave more for summer! Ahh.. can’t wait for all the fresh produce. I’m so jealous that you got to hold a koala! It sounds like an incredible experience. This overnight oatmeal has me longing for summer and juicy ripe peaches. The streusel topping is like icing on the cake. YUM! I saw the picture on Instagram! That is so fun!! It looks like you are having a great time! And I am loving these oats, I eat peach oatmeal all the time in the summer! I have always thought overnight oats seemed kind of gross (cold oatmeal?) but adding peaches??! YUM! I NEED to try this! Plus the struesel on top looks amazing! 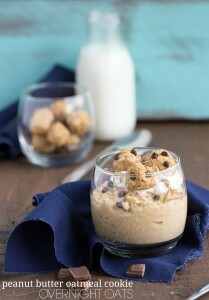 Chels you always have the most fun and creative overnight oats recipes, love this one! I’ve never wanted to make overnight oats before, but these have me singing a different tune- plus I have peaches in the fridge! I am totally jealous that you got to hold a Koala! I lived in Oz for almost 2 years, and it was just amazing. I met my fiance there! We are in Canada now but who knows? Someday we may go back. And I will hold a koala, LOL! These overnight oats look so delicious! I for some reason have never had overnight oats, but they look like a delicious and nutritious breakfast idea. Awww the koala picture is just too cute! What a fun experience for the family! 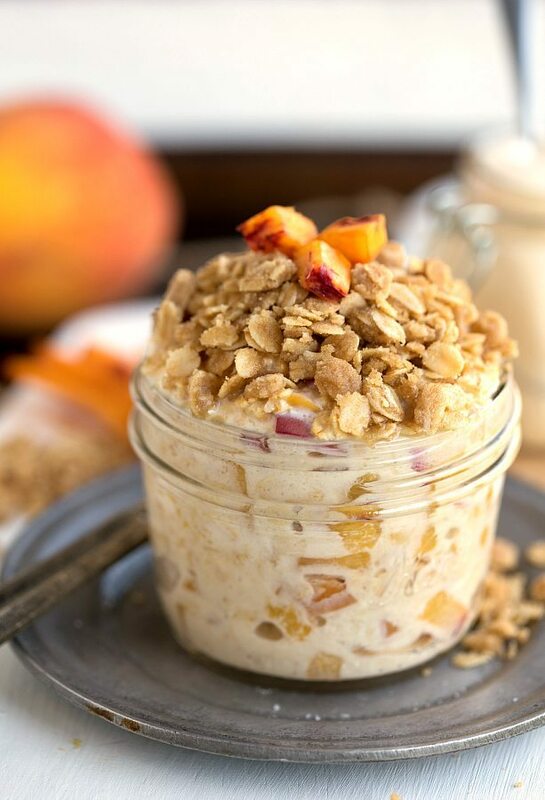 These peach overnight oats look divine! Pinned! 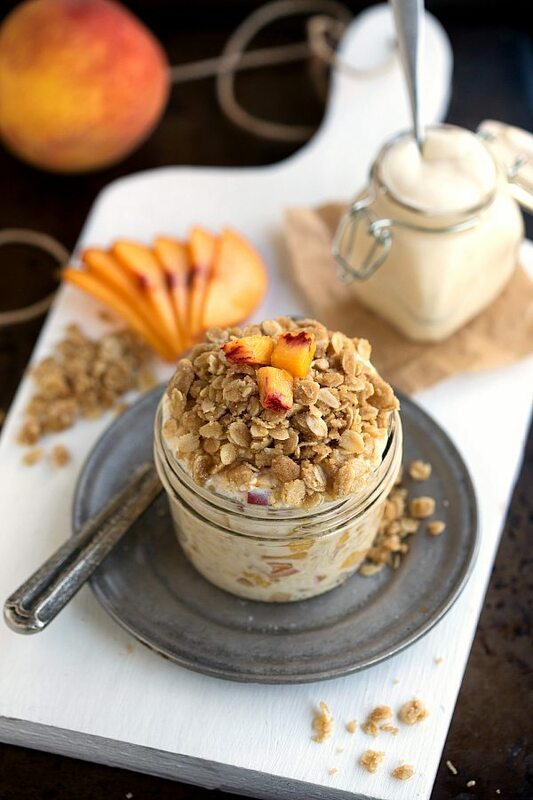 I love the idea of overnight oats and that peaches are involved. Yummy. Hold a koala?!? AND streusel topped overnight oats ?!?? You are just too awesome, Chelsea! awwwww how sweet that your little babe got jealous of his daddy holding someone else! and that the koalas are so cuddly!!! I’m such a sucker for peaches. LOVE them. And now I can’t stop thinking about these overnight oats. This is a breakfast I would HAPPILY wake up for! You got to hold a koala?? That’s the most awesome thing Chelsea!! Especially when they came over to be cuddled… That’s like a dream come true. Our little dog loves to cuddle about as much, but it’s just not quite the same. 😉 Pinned! Is this recipe able to use another fruit other than peaches? Like apples or raspberries? Thanks! Is there any recommended substitute for coconut oil? It is a bit over my budget usually ….